Just over a year ago, I discovered and purchased this wristlet on Etsy. It fits nicely inside my purse, or I can use it alone when my purse is more than I need. This baby has held up beautifully! It is perfect for garage sale-ing, or any other time I don't want to lug an entire purse around. There are 2 pockets inside. One pocket for cash/driver's license/cards and one for my cell phone. Love it! If you'd like to check out this seller on etsy, click here. If you'd like to check out her website, click here. Her business name is RKEMdesigns and her name is Donabel. Great fabrics, great designs. When you order from her, tell her I sent ya! She'll be tickled. Have you discovered Etsy? If you're not careful, you'll get addicted! Looks very interesting. I'll have to check it out. My boys have forbidden me from ever wearing a fanny pack again. They are so convenient but not very pretty! I'm kidding. I do appreciate the quality and I think it's awesome that you're supporting small business, still the backbone of this country. I hope Donabel gets some extra business from your post. We have a vendor at the shop that sells the wrist-thing that holds your keys ... looks just like yours only a keyring instead of a wallet. 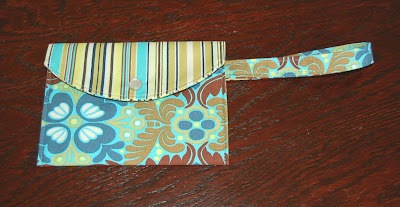 I do so LOVE that wallet idea...and etsy. I LOVE Etsy! Cute wallet. Very cute! And Etsie is just about one of the cleverest of things.